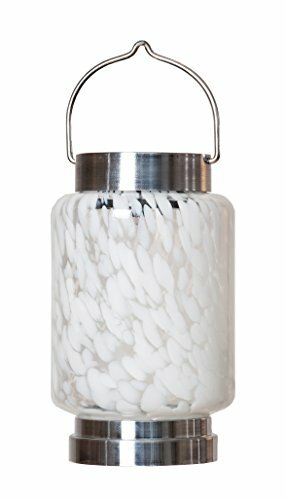 Brighten your surroundings with a Solar Boaters Lantern in White from Allsop. Made of hand-blown glass, each Lantern is unique. Hang your lantern to create instant ambiance from a tree, your deck, arbor, archway, umbrella, tree, wreath, fence line or anywhere. Enjoy the glow night after night, year around. Each of our tabletop hand-blown glass lanterns has a steel hanging handle molded into the housing compartment along with a built-in light sensor, Siemens solar panel, a rechargeable coin cell battery and a warm-white LED light. For questions and replacement parts, please call customer service at 1-866-425-5767. This lantern has an on-off switch and is designed to be left on, providing it's glow for up to 2 years. Once the glow fades, simply replace the battery and continue enjoying your lights. As the founders of the concept "solar garden art," Allsop Home & Garden is known for unique combinations of green solar technology, efficient LED lighting, artisan hand-blown glass and use of other creative materials with solar power. With this in mind, our mission is to create innovative and meaningful products that are as important to you as they are to us. Allsop Home & Garden is a small family business, started by a father and a daughter who were inspired to create a better wheelbarrow. Now, nine years later we are still inspired to create the best, the most innovative and conscientious products possible from original garden tools to solar lighting. Allsop. Illuminate the outdoors. [NEW 2018 MODEL] LED Flame bulb light bulbs, Fire Decorative Flickering effect, 105pcs 2835 Simulated Decor Atmosphere Lighting Vintage Flaming for Bar, patio, Festival Decoration By CS & Co.